Sally Ride wasn't just a pioneering astronaut. With coauthor Tam O'Shaughnessy, she was also an award-winning children's science writer. Join Sally and Tam as they explore space and investigate the impact of climate change on our home planet. And Tam has just published a photobiography about Sally, which is receiving rave reviews! Years before millions of Americans tuned in to watch her historic space flight aboard the Challenger in 1983, Sally Ride stayed up late to watch Neil Armstrong become the first person to walk on the moon. The next morning, she woke up to win her first round match at a national junior tennis tournament. Drawing upon poignant, funny, and heartwarming memories and a wealth of never-before-published photographs and memorabilia, this is an intimate portrait of America’s first female astronaut, from her formative years to her final moments. Before she was an astronaut, Sally was a competitive tennis player who was told by Billie Jean King that she could play on the pro circuit. Before she earned a Ph.D. in physics, she was called an underachiever by her high school classmates. 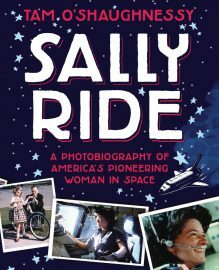 After her first historic space flight—she took a second in 1984—Sally continued to break ground as an advocate for space exploration, public policy, and science education, who fought gender stereotypes and opened doors for girls and women in all fields. Written by Sally’s life, writing, and business partner Tam O’Shaughnessy, this vivid photobiography offers an unprecedented glimpse into the life and mind of the famously private, book-loving, tennis-playing physicist who made history. Mission: Planet Earth introduces young people to the changes taking place in Earth's climate. Beginning with Sally Ride's unique astronaut's-eye view of Earth's fragile atmosphere, Mission: Planet Earth describes how the water cycle, the atmosphere, and other systems shape our world, and how a disruption in one system can affect the entire planet. Pioneering astronaut Sally Ride and award-winning science writer Tam O'Shaughnessy draw on the latest scientific research to present a clear, even-handed account of the current state of climate studies. Illustrated with helpful diagrams and stunning photographs from the front lines of climate change, the book celebrates Earth's natural complexity—and issues a call to action to a new generation. conserving energy at home, at school, and around town. switching to clean energy to power your life. making some noise to let others know you care and to spread the word about how to keep our planet healthy. It's your planet—get out there and make a difference! In Exploring Our Solar System, the award-winning team of Sally Ride and Tam O’Shaughnessy guide readers on a thrilling tour of our solar system, starting with the birth of our Sun. The book guides readers from the four terrestrial planets—with a special stop at our unique, life-supporting Earth—through the Asteroid Belt to the four giant planets, tiny Pluto, and beyond. With over 120 stunning photographs and helpful diagrams, this is the definitive guide to our solar system. In The Mystery of Mars, pioneering astronaut Sally Ride and noted science writer Tam O’Shaughnessy present a comprehensive overview of our planetary neighbor. With its atmosphere, rocky canyons, extinct volcanoes, and icy polar regions, Mars has many things in common with Earth. Water once flowed over its surface, and it’s possible that life may have existed there. Comparing the two planets’ evolution, geology, and geography, the authors explain what we know about Mars today—and what we hope to learn in the future. Sally's two flights aboard NASA's space shuttle gave her a spectacular view of Earth and a unique perspective on our planet. In The Third Planet: Exploring The Earth From Space, she describes what looking down from space reveals about Earth's complex and delicate environment. She and co-author Tam O'Shaughnessy explore the relationships between the atmosphere, oceans, landmasses, and living things. From microscopic plankton in the ocean to the dense rainforests of the tropics, life is evident everywhere on Earth—including human life, which affects Earth in ways that are visible even from space. Launched in 1977, the two tiny Voyager spacecraft made an extraordinary journey across billions of miles of space to give scientists their first close look at the solar system’s most distant worlds. Pioneering astronaut Sally Ride and noted science writer Tam O’Shaughnessy re-create the Voyager adventure in this dramatically illustrated book. They describe the spacecraft’s astonishing discoveries, from previously unseen rings around the giant planets to unimagined volcanoes on their moons and unbelievably violent storms in their atmospheres.